This is the website of Ruth Ellison, a Design Researcher and User Experience practitioner living in Canberra, Australia. This site contains thoughts about User Experience and life. There are multiple events happening around the world. 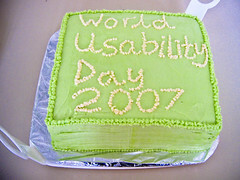 We even got a World Usability Day cake (pictured above) baked by Sisira Adikari’s (organiser) wife and some delicious Indian samosas! YBEfbJ I loved your blog.Really looking forward to read more. Keep writing.